Interesting article from Gizowski et al last week on the role of the suprachiasmatic nucleus in regulating pre-sleep anticipatory thirst via the OVLT in mice. In med school we had to memorize the major role of both of these regions, and my mnemonics were that the suprachiasmatic nucleus makes you charismatic (because you are well-rested), while the OVLT controls how much ovaltine you should drink. Rodents are known to increase their fluid intake 1-2 hours before sleeping, which is called anticipatory thirst because the rodents want to make sure that they will have enough water in them to make it through the night (presumably without a dry mouth!). Gizowski et al’s definitive experiment to show the interplay between these brain regions involved expressing two types of channelrhodopsins in vasopressin-expressing neurons in the suprachiasmatic nucleus in two groups of mice. As you can see, blue light in the blue-responsive mice caused increased water intake PRIOR to the normal anticipatory thirst at levels ~ 3x above baseline. On the other hand, yellow light in the yellow-responsive mice caused decreased water intake at the expected anticipatory thirst to an insane degree. Basically, responsive mice didn’t drink at all when they shined yellow light and inactivated the SCN -> OVLT pathway. This effect of yellow light seems too strong to me. Shouldn’t it just be stopping the increase that is typically seen pre-sleep? Instead, it seems to be completely eliminating drinking behavior entirely. One way to explain this finding is that the SCN -> OVLT pathway might be active at other times other than pre-sleep, and it is just MORE active in the hour or two before sleep. Despite a pretty extensive search, I can’t figure out whether humans have also been shown to have increased thirst prior to sleep. On one hand, there are plenty of anecdotal reports of this, while on the other hand, rodents and humans have pretty different life histories. Plus, the authors probably would’ve mentioned it if there was good evidence of pre-sleep anticipatory thirst in humans. Even if humans don’t have pre-sleep anticipatory thirst, this is still quite an interesting study, as this system is likely a good model of how suprachiasmatic nucleus axons project (with vasopressin-producing neurons?) to several other brain regions to control activities that are regulated by the perceived time of day. Above is a model of a generic synapse, showing the (upper) pre-synaptic nerve terminal and the (lower) post-synaptic neuron. The pre-synaptic neuron is constantly releasing vesicles that contain neurotransmitters (NT) into the synapse that diffuse to the post-synaptic neuron, and when a pre-synaptic nerve terminal receives an action potential, the rate of this release is altered. Upon secreting its store of NT molecules, the extra membrane from the vesicle is usually incorporated into the pre-synaptic plasma membrane. 1) Kiss and run. Small synaptic vesicles make transient contact with the plasma membrane forming a short-lasting fusion pore, through which the neurotransmitter is released, then it is released. This seems to be the least common mechanism and it is somewhat controversial. 2) Fuse and collapse. This is a common endocytosis mechanism in all cells. It’s slower than the other mechanisms because it requires the recruitment of the clathrin complex by the adaptor protein-2 (AP-2) complex. 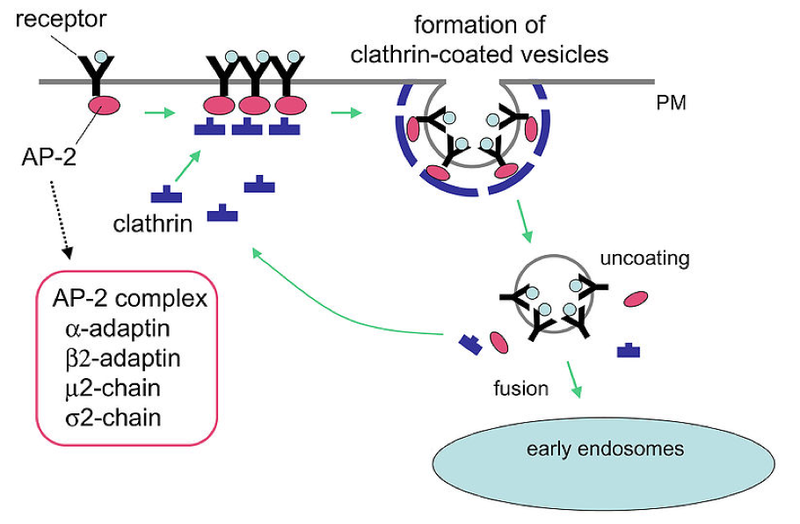 Clathrin, a protein, is recruited to form a lattice around the membrane. It is removed after it collapses the vesicle from the plasma membrane (PM). In pre-synaptic nerve terminals bulk endocytosis leads to the formation of endosomes, from which synaptic vesicles can bud off. This mech often occurs during episodes of high-frequency action potentials. Note that although all of the above drawings are in 2d, the brain is 3d so it will be more useful if you can visualize it like that. Models of endocytosis are attracting and should continue to attract attention because of the key role they likely play in synaptic plasticity. Shupliakov O, et al. Synaptic Endosomes, NCBI bookshelf ID NBK6352, link. Interesting, ostensibly simple study: Buckholtz et al used PET (which is > fMRI, IMCO) on volunteers given amphetamine using a radio-labeled D2-like ligand, fallypride. They found a significant inverse correlation (r = -0.42 and -0.35 for the left and right striatum) between average D2-like receptor binding potential (i.e. the density of “available” receptors) and striatal dopamine release after the introduction of amphetamines. They also found a significant positive correlation (r = 0.48 and 0.47 for the left and right striatum) between more dopamine release and increased subjective pleasure from amphetamine. This research is often ballyhooed due to its applications to free will and law / politics, but I find it especially interesting from a strictly neuro perspective. What other areas of the brain use this ligand binding potential mechanism to transduce synaptic variability into psychological variability? Evolutionarily, it seems unlikely that this is the only such system. Buckholtz JW, Treadway MT, Cowan RL, Woodward ND, Li R, Ansari MS, Baldwin RM, Schwartzman AN, Shelby ES, Smith CE, Kessler RM, Zald DH. 2010 Dopaminergic network differences in human impulsivity. Science. The link between creativity and baseline dopamine receptor availability in key brain regions is fascinating, especially when you attempt to consider how alleles pushing individuals along the schizophrenia spectrum might be adaptive. The low dopamine binding potential in the thalamus of those who scored highly on the divergent thinking test (i.e. are more creative) are probably related primarily to a reduced density of dopamine D2 receptors there. One explanation for divergent thinking is that idea generation is based on random free association between concepts. So by increasing the quantity of ideas, the probability of coming up with some ideas good enough to reach consciousness and pass conscious filters for originality and flexibility will be higher. Decreased dopamine binding potential in the thalamus could help this process because 1) it lowers thalamic gating thresholds, resulting in decreased filtering and less “autoregulation” of information and 2) it decreases inhibition of pyrimidal neurons in the prefrontal cortex, thus making prefrontal networks better at switching sets and combining diverse mental stimuli. The link between tests of divergent thinking and impulsivity is hard to characterize, but it seems that impulsivity is negatively correlated with creativity as measured by divergent thinking. For example, Fuqua et al (here) found that reflective children had average z scores on the divergent thinking test of + 0.28 higher than the mean and that impulsive children had average z scores of – 0.30 lower than the mean. Contrasting the findings of Manzano et al and Lee et al (briefly explained in my last post here), it seems that higher D2-receptor binding potential in the striatum is correlated with lower impulsivity. But, higher D2-receptor binding potential in the striatum trends towards higher creativity as proxied by divergent thinking tests (see B**). So the neurochemical data seems to be consistent with the behavioral data. * That is, the ratio of dopamine-receptor complexes to free dopamine at equilibrium. ** Although the striatal findings weren’t statistically significant, there is a trend, plus the power wasn’t huge (PET scanning isn’t perfect and n = 14), and plus this is my blog so quit yer hollerin’. Fuqua RW. 1975 An investigation of the relationship between cognitive tempo and creativity in preschool-age children. Child Development, link here. Inhibiting translation in hippocampal neurons for short periods of time (2 hours) has differential presynaptic effects based on the cell’s developmental time frame. In young neurons it inhibits induction of LTP and leads to reductions in the pool of available vesicles for exocytosis, which is exacerbated by synaptic activity. In mature neurons, the effects are dependent upon the size of the styryl dye loading site. If the loading site where synaptic vesicle release is measured is less than 1.35 µm2, then the effects of protein translation are similar to young neurons (i.e., reductions in pool of available vesicles). But if the loading site is >1.35 µm2, then the fluorescence dye intensity is not affected much by protein translation inhibition, indicating that their synaptic vesicle recycling pools are unchanged by inhibition of translation. The authors suggest that the reason for this threshold (!) effect is that a different mechanism is used by the younger sites, where CaMKII leads to vesicle recycling. This is opposed to the larger sites of mature neurons, where protein kinase A is localized to regulate vesicle recycling. It’s possible, though, that the reality is more continuous and that protein kinase A / A-kinase anchor proteins are merely upregulated at larger mature sites. The effects of protein translation inhibition could mimic the effects of selective downregulation during development and thus represents a mech by which certain synapses could be pruned. It also suggests that, short-term, protein synthesis itself is essential to synaptic function only in so far as the pool of synaptic vesicles needs to be recycled. These can look differently depending on the species and type of neuron. Generally they are recognizable by a high linear electron density in the EM image and close apposition between pre and postsynaptic membranes. Sometimes, increasing the EM magnification is necessary to see them. The enzyme protein phosphatase 2A is necessary for the development of structurally normal active zones across the cleft from glutamate receptor clusters. Visquez et al expressed a nervous system-specific transgene that lacks the protein phosphatase 2 catalytic subunit in fruit flies. These fruit flies had less enzyme activity and a ~ 30% reduction in antibody staining to active zones at neuromuscular junctions. The authors speculate that this occurs because glutamate receptors begin to cluster in postsynaptic densities, but due to the inhibition of protein phosphate 2, cannot correctly recruit the active zone protein brunchpilot, and so end up unapposed to an active zone. This suggests that in the formation of synaptic connections in the neuromuscular junction, the postsynaptic receptor clusters form first and the active zones follow. Vizquez NM, et al. 2009 PP2A and GSK-3β Act Antagonistically to Regulate Active Zone Development. doi:10.1523/JNEUROSCI.5584-08.2009. Link here.